When it comes to the modern aerospace industry, Mexico is becoming a specialist in MRO (maintenance, repair, and overhaul). According to AeroStrategy (a management consultancy for the aviation and aerospace sector) there’s a profound shift taking place in the way aircrafts are conceived, produced, and supported. The consultancy notices a movement from multinational cooperation to horizontal specialization, or in other words: a literal change of the landscape of aerospace maintenance infrastructure. Original equipment manufacturers and service suppliers tightly integrate functions such as engineering, manufacturing, and customer support across multiple locations on a global basis. This intersection of manufacturing globalization results in new facilities on low-cost locations. Brazil, Mexico, and Central America for example are marked as attractive investments for labour intensive activities, such as airframe heavy maintenance, and have to complement existing MRO clusters in America and Canada. A similar pattern is shown in Europe, the Middle East and Africa, where one can find attractive investment for labour intensive activities in North Africa and Eastern Europe. In recent years important investments in the aerospace sector have taken place in Mexico, giving this nation a total aerospace employment of 20,000 people, with exports of more than US$ 3 bln in 2008. 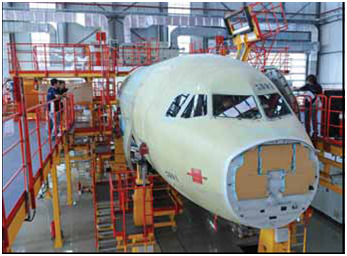 In the same year, US$1 bln was invested in the aerospace sector. AeroStrategy expects these figures still to be growing significantly in the years ahead. Although Mexico until recently had little to do with aerospace, the nation came out to have achieved the most manufacturing investments in the aerospace sector. This is not surprising if one studies Mexico’s strong record in the automotive and consumer electronics industries, based on a low-cost, dependable, and skilled labour force. In the near future more will be heard from emerging economy Mexico, meanwhile enjoying fresh opportunities to increase even more its aerospace sector.